The microform collection located at Howard-Tilton Memorial Library (6th Floor) features microfilm/microfiche printers and scanners. Patrons can read, scan, or print microforms; edit scanned documents; save documents to a flash drive; and send files to an email account, Dropbox, or a Google Drive account. Many microform collections are accompanied by a paper guide that aids in scholarship by acting as an index, often by author, title, or subject. Rather than scrolling through every single reel or scanning each fiche to find relevant information, a microform guide or index helps users quickly and easily find relevant topics and their location on the reels or fiche. While there are many paper-editions of the guides on the 6th floor, digital copies of the microform guides can be viewed remotely. 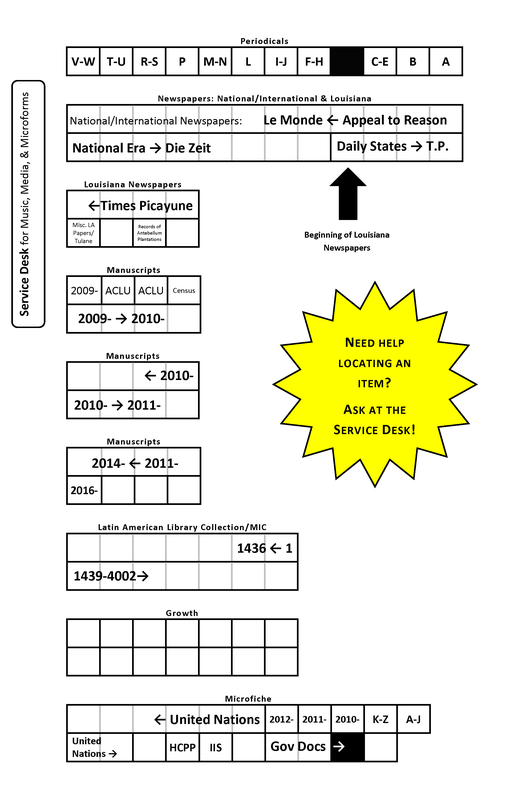 If you know the title or call number of the microform collection you are interested in using, check this guide to see if it has a digital guide available. Once you have located the correct film, our microfilm/microfiche scanners enable patrons to read and print microforms; edit the scanned images using advanced editing software; save documents as OCR-enabled .pdfs, tiffs, or .jpgs; scan documents to a flash drive; and send the files through email, Google Drive, or Dropbox. Our new microform scanners on the 6th floor allow patrons to easily digitize historic manuscripts from our microform collection. Not only can patrons edit the images using the software, but they can also save printed documents as OCR (text-searchable) PDF files. When you are done, please place used microfilm and microfiche in any of the bins labed "Microforms Returns" located on top of the microforms cabinets or on the service desk.